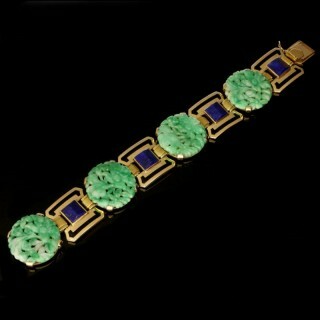 An Art Deco gold, jade, lapis lazuli and enamel bracelet by Gerard Sandoz, c.1928, the stylish bracelet composed of four jadeite jade discs, pierced and carved with a floral motif, alternating with waisted highly polished square gold plaques, each set to the centre with a prism of lapis lazuli, decorated with geometric black enamel edges and gently curved in profile, the articulating links of deeper yellow gold, all to a concealed tongue and box clasp with additional figure of eight safety catch. 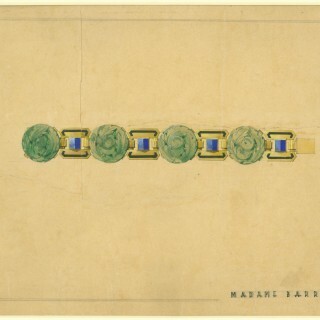 18ct Yellow Gold, clearly signed Gérard Sandoz of Maison Gustave Sandoz, with French assay marks for 18ct gold and with the makers mark for Georges Lenfant. 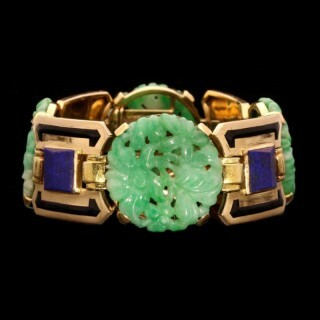 Bracelets of similar design with articulated links of polished metal and carved gemstone plaques are illustrated in Art Deco Jewelry edited by Évelyne Possémé, page 191. 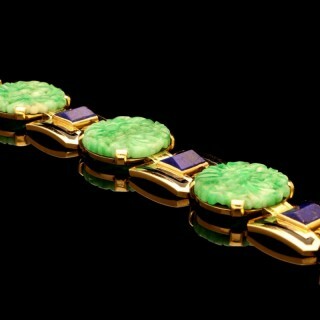 A similar bracelet of gold, jade and carved lapis-lazuli featured as lot 384 in Sotheby’s New York Magnificent Jewels sale in April 2014.